Annette Bik, violinist with the Klangforum Wien, is familiar with both early and contemporary music. On her first solo album, “Double Bach”, she presents a fascinating experiment: she asked leading contemporary composers to write a double of each movement of Johann Sebastian Bach’s famous “Partita in h-Moll”. The idea seemed even more compelling since Bach also added a variation, or double, to each movement of his suite. Summer 2018. Annette Bik steps into the beautifully restored chapel of the castle at Buchberg am Kamp. A not very large space, every last seat taken by a not very large audience. She soon fills it with the sounds of her violin, which measure out an enormous cosmos, with pauses like a thousand windows in the cathedral she creates space for within the smallest chapel. She is playing Bach’s “Partita in h-Moll, BWV 1002” and, for the first time in public, four of the contemporary works she has commissioned, which update and comment on Bach’s work. You listen in the windows and float on the arches of invention, of inventio, of the first stage of speaking, the collection of materials, the discovery or invention – they are not the same, but no matter – and whilst you ascend with the Allemanda, you are preparing yourself for the other, but are still stunned when it arrives, as if a car horn was breaking in. 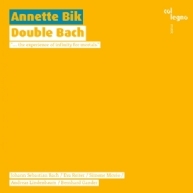 Annette Bik presents the new with just as much divine seriousness as Bach’s music and shows us how great the musical cosmos is and that it is continually expanding; and how it is always rearranging itself, how it never loses what has been found but is always inventing anew. Her virtuosity and her skill in pro- ducing the sounds of such different languages as Bach’s and that of Eva Reiter, Simone Movio, Andreas Lindenbaum and Bernhard Gander, are exceptional and have her audience listening attentively in awe and amazement. On the wings of the first Bach movement, in which everything has already been said, everything already discovered in terms of musical speech, sway all the rest, the doubles and their doubles, the original flashing through time and again. Eva Reiter’s enhancement addresses the material itself, the instrument; Simone Movio abandons himself to a dream and through its doors approaches the original; Andreas Lindenbaum plays the sufi and spins around on the bass line; Bernhard Gander garlands his Borea double with the ivy of Dionysius. Any discussion of Bach cannot not avoid, even in the lightest or most ironic form, the religious, the absolute. Even if this absolute is simply a “sender”, as Hans Magnus Enzensberger calls it in his poem “Empfänger unbekannt – Retour à l’expéditeur”: “Many thanks for the clouds / many thanks for the Well-tempered Clavier / and, why not, for the warm winter boots.” To put it in less elegant, simpler terms: Bach is the all too human in total innocence, Bach is a perfect cosmos for sceptics, Bach is the experience of infinity for mortals. Annette Bik graduated from the Mozarteum conservatoire in Salzburg. From 1982 to 1989 she was a member of the world-famous Hagen Quartett and the Chamber Orchestra of Europe. She additionally took part in international chamber music tours with Gidon Kremer and other well-known musicians. She is guest musician at Concertus musicus Wien and is actively engaged in teaching at the School for Music and the Performing Arts. Annette Bik is a founding member of Klangforum Wien, with whom she has performed throughout the world as a soloist and chamber musician, as well as in ensemble. CD recordings of her work have been released by KAIROS, ECM, Deutsche Grammophon, Philips and Durian, amongst others. If I had to name an unforgettable experience in my life which definitely con- tributed to the emergence of my desire to engage more with early music, I would say it was the experience of listening at the age of twelve to a Musica Antiqua Köln concert on baroque instruments. The unique sound of the range of baroque instruments affected me deeply. The impression made by this listening experience also led me to attend Nikolaus Harnoncourt’s lectures on “Performance Practice of Early Music” in theory and practice during my studies in Salzburg. His passionate drive and his burning desire to let music speak in the most direct and immediate way greatly shaped my further understanding of music. When I go to a concert, I always find it incredibly exciting if the programme consists of compositions with as radically different dates of origin as possible. I love this clash of the centuries. Not having an acoustic bridge to help me to understand why the music today sounds as it does, but simply a musical factual report: back then it was like this, today like this. The basic knowledge of music history at the back of your mind has a life of its own in any case, and gently spins its own delicate connections. Over the years, and spurred on by my involvement with contemporary music as a violinist in Klangforum Wien, I increasingly felt the desire to bring these two apparently different worlds – early music and new music – in direct association and harmony, and to document the result on a CD. Bach’s “Partita in h-Moll, BW V 1002 für Violine Solo” was a natural choice. For each of the main movements of Allemanda, Corrente, Sarabande and Tempo di Borea, Bach composed what is known as a double, a kind of variation based on the previous movement. So I commissioned four contemporary composers to write their own doubles based on these Bach compositions, but transferred to the present with their own compositional form of expression. The terms of the commission for these compositions also stated that each individual work should be able to stand alone and be of approximately the same length of time as the Bach originals providing the template. The result is four very different, exciting works, composed by Eva Reiter (Allemanda), Simone Movio (Corrente), Andreas Lindenbaum (Sarabande) and Bernhard Gander (Tempo di Borea).